In 2016 English vineyards were hoping for a bumper harvest. Instead, what most of us got was a modest-sized crop after poor flowering weather, followed by a long period of cool temperatures and heavy rains. But the weeks leading up to harvest were warm and dry resulting in near perfect grapes, without any botrytis mould and very high sugars. With careful vinification this modest crop should produce excellent wines. We are very grateful for the generous help from friends and family who came to pick. The harvest took place over two weekends, the 15/16 and 22/23 of October, sometimes with over 30 people. It is a wonderful social occasion with lunches, when the weather allows, in sunshine on the terrace – a special moment in the vintner’s calendar. Thank you all. Every year attracts a surprising and eclectic mix of visitors to the vineyard, and this year was no exception. 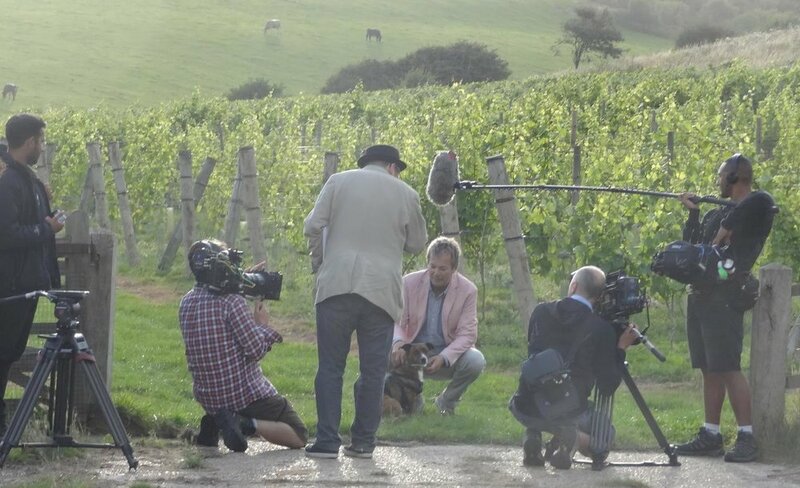 Most memorable perhaps was a delightful visit from Julian Clary with a film crew of ten, Breaky Bottom featuring in his series of ‘Walking my Dog’. 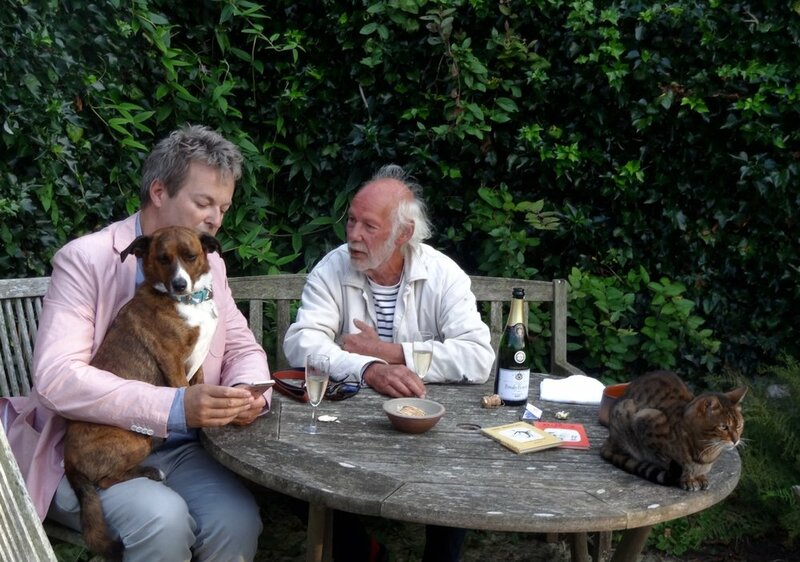 Julian’s dog Albert had an uncertain first meeting with our cat Toto; although they didn’t become life-long chums they were eventually respectful of each others presence. Julian loved the wines, and charmed us all with a bag-full of stories. This TV programme is to be broadcast shortly. Andrew Jefford (wine writer for Decanter and many other publications) and Dermot Sugrue, wine-maker at Wiston Estate, are close friends of ours. Andrew made an overnight visit to BB in September and the following morning Dermot came for an amazing breakfast party (cooked by me!). Afterwards we sampled last year’s wines after their first fermentation in tank. The experts’ conclusions – great potential, with the Breaky Bottom ‘signature' very evident even at this early stage. These 2015 wines were bottled a few days later and cellared for their second fermentation. Andrew was to go later in the day with Dermot to Wiston, no doubt tasting an array of his exceptional sparkling wines. Before departing ‘We Three Kings’ were pictured outside the Breaky Bottom winery. Fourth & Church (www.fourthandchurch.com) a new wine bar/delicatessen in Hove run by Paul Morgan, serve the most delicious accompaniments to their fine range of wines. Last May they asked Dermot and I to give a special wine tasting. The one-off event was a sell-out and we had a wonderful evening showing six wines each from Wiston and Breaky Bottom. It was so rewarding to serve our sparkling wines to a knowledgeable audience, full of questions and ready to compliment and be critical of each of the wines; very useful feed-back for the winemakers. 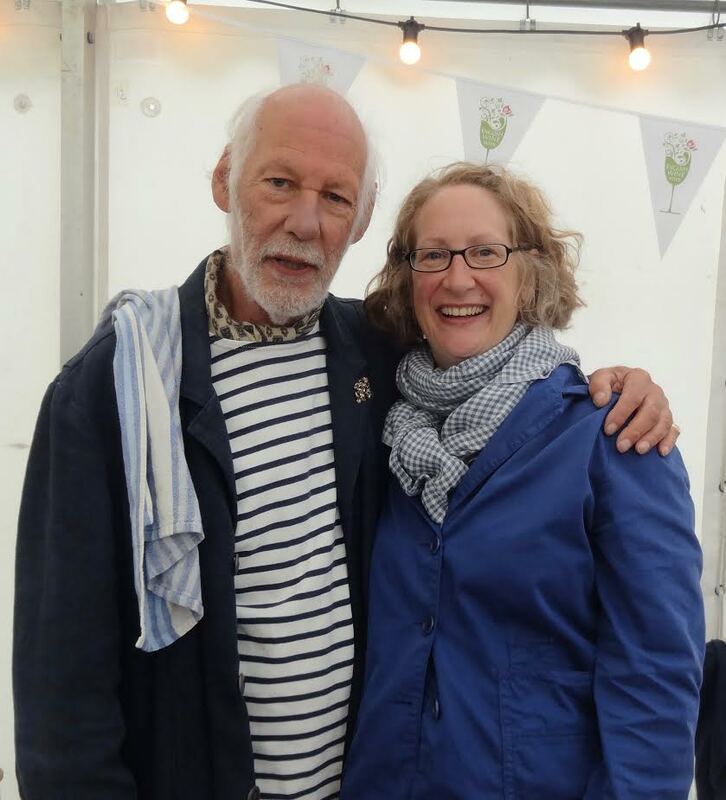 Also in May, immediately following the Fourth & Church tasting, Dermot and I showed our wines at the Hove Lawns Food & Drink Festival. The English wine tent was brilliantly organised by Henry and Cassie of Butlers Wine Cellar, Queen’s Park Road, Brighton (www.butlers-winecellar.co.uk). Christina, my daughter Emily and I had a very busy two days giving tastings of four Breaky Bottom vintages. It was heartening to see the close attention given to our wines by the wine drinking public. Their understanding of the quality of English fizz continues to increase. 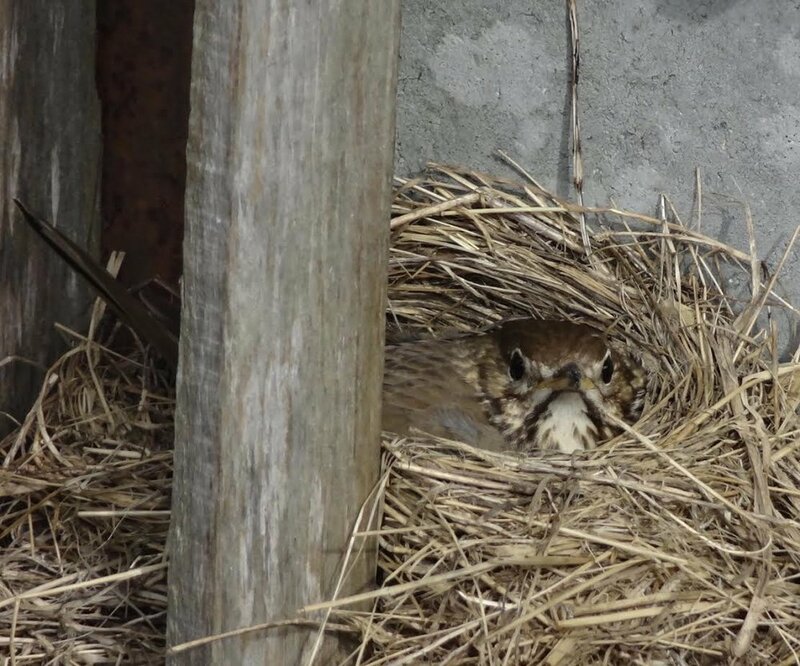 Lastly I include a photo taken in April 2016 of a nesting Song Thrush, sited precariously in my lambing shed at lambing time. Thrushes at Breaky Bottom are in steep decline so I was delighted that the youngsters fledged successfully, despite my close attention day and night to the ewes and lambs.